In North Carolina State Parks, Thomas Lehman and Michael Lee treat readers to a multidimensional view of the developed parks with more than 260 photos, and text that ranges over park features, botany, ecology, geology, history, funding of park development, and on almost every page an appreciation of the parks' natural beauty. The authors frequently move from descriptions to explanations of the parks' natural phenomena. Boasting more than 50 parks and natural and recreation areas, North Carolina's state park system offers something for everyone. Twelve million people seek sanctuary in the parks' diverse natural areas every year and learn about cultural and natural history from interpretive rangers. 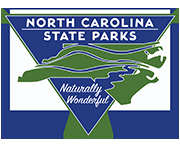 North Carolina State Parks: A Niche Guide connects people to parks and is the essential companion for out-of-state visitors and North Carolinians alike. This illustrated guide to The Nature Conservancy's preserves and projects in North Carolina is an updated and enlarged edition of the 2002 volume. This new edition includes several newly protected areas and reflects the Conservancy's focus on the conservation of whole landscapes. The guide features descriptions of each preserve or project, conservation history of each site, and the information you will need if you'd like to visit the site. The book is a guide for exploring some of this state's best remaining wild places. A handy field guide to 100 of our most common and intresting spiders. Includes color pictures, descriptions, web and hunting, egg sac and eggs, life cycle and range. An over 300 page field guide with color pictures, family, height, leaf, bark, flower, fruit, habitat and range of trees found in the Carolinas. There's nothing quite like cooking on an open fire. This book is for the novice with basic menues to include breakfasts, lunches, and dinners made with fish and meats. Laser printed on PVC, this "how-to" tool is waterproof, dirtproof and pocket-sized. This popular book features more than 50 s'more recipes. Include gourmet recipes, s'mores for the holidays and s'mores for adults. For many people, seashells are just part of the beach scenery--thousands of pretty but nameless objects strewn along the shore. Other people know the names of shells but often wonder how they were formed and what type of animal lived inside. Such incidental knowledge may not seem important, but it can encourage people to observe their environment more closely and to gain a better understanding of it. Geologist Kevin Stewart and science writer Mary-Russell Roberson begin by explaining techniques geologists use to "read" rocks, the science of plate tectonics, and the formation of the Carolinas. The field trips that follow are arranged geographically by region, from the Blue Ridge to the Piedmont to the Coastal Plain. Richly illustrated and accompanied by a helpful glossary of geologic terms, this field guide is a handy and informative carry-along for hikers, tourists, teachers, and families�anyone interested in the science behind the sights at their favorite Carolina spots. Many have seen Grandfather Mountain, but few people know it well. Now come visit the Grandfather Mountain in its complete history, and full stature as one of the world's great mountains. Grandfather Mountain: A Profile travels back to the origins of this living entity, then traces its unique development -- geological, meteorological, natural, prehistoric, and modern humans -- to the present day, where it still stands alone as the grand patriarch of the Blue Ridge Mountains. The northwest counties of North Carolina are rich in natural areas waiting to be explored and enjoyed. Grandfather Mountain, Pisgah National Forest, Roan Mountain, Linville Gorge Wilderness Area, the Blue Ridge Parkway, Mount Jefferson State Park, and the New River are some of the many special locales in this outstanding section of the Southern Appalachians. This comprehensive guide uses a distinctive habitat approach to the region, describing the different habitats of the region including the rich Northern Hardwood Forests and Coves, the vast Mixed Oak Forests, the scenic Grassy Balds, the high elevation Spruce-Fir Forests, and the unusual Mountain Bog communities.